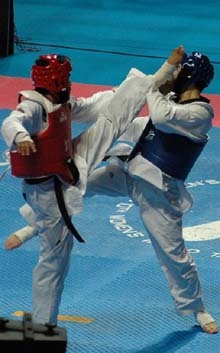 IOC announces that two bronze medals to be awarded in Taekwondo competition at Olympic Games. The number of bronze medals to be awarded in the taekwondo competition at the Olympic Games will be expanded to two starting with the 2008 Beijing Olympic Games. In a recent letter to the World Taekwondo Federation, the International Olympic Committee said it accepted the WTF request for two bronze medals in the taekwondo competition at the Olympic Games. "I am pleased to inform you that the IOC has decided to agree to your request and to award two bronze medals for the sport of taekwondo at the Olympic Games, beginning at the Beijing 2008 Olympic Games," said Mr. Kelly Fairweather, sports director of the IOC, in his letter to WTF President Chungwon Choue. The WTF, the world's sole taekwondo governing body recognized by the IOC in 1980, sent a letter to the IOC on April 10, 2007, asking the IOC to expand the number of bronze medals to be awarded in the taekwondo competition at the Olympic Games to two per weight category. The WTF has a worldwide membership of 184 countries. Since the 2000 Sydney Olympic Games, the WTF has conducted a single elimination tournament system with double repechage to determine one third-placed winner. "Nevertheless, as with the other combat sports in the Olympic program, an additional fight to determine a single bronze medalist could seriously undermine the athletes' health and all this would be a burden to the Organizing Committees of the Olympic Games," said the WTF letter. An inspired WTF sees that the IOC's decision would greatly contribute to the further development of taekwondo. The WTF regards the decision as due recognition by the international sports community, including the IOC, of the WTF's reform programs since the latter part of 2004. Accordingly the WTF plans to produce follow-up measures for the Olympic competition methods, including the repechage system. On Feb. 6, 2006, the IOC decided in its Executive Board meeting in Torino, Italy, to increase the number of taekwondo competitors by two male and two female athletes to 128 for the 2008 Beijing Olympic Games. The decision came after the WTF's request to the IOC for the increase in the athlete quota for taekwondo competition at the Olympic Games after the establishment of the WTF's fifth continental union, the Oceania Taekwondo Union, in July 2005. The WTF is also scheduled to receive more TV rights revenues from the IOC starting from the 2008 Beijing Olympic Games, as the General Assembly of the Association of Summer Olympic International Federations (ASOIF) in Beijing on April 24, 2007, approved the Council proposal to promote the WTF from Group E to Group D for its contribution to the overall Games program.